Do I need cycling shoes? How do cycling shoes work? Cycling can be easily done using tennis shoes or any other shoes if you are going for a short ride. Tennis shoes may work more often for a general commute. Serious riders, however, need to invest in cycling shoes for some reasons besides the fact that they look cooler in them. Cycling shoes provide some varied riding options which enhance cycling both for speed and power. Cycling shoes come with systems that allow the rider to keep feet glued to the pedals for more efficient strokes that provide faster speeds and control on the bike. Cycling using regular shoes for long distances causes slipping, and the use of additional energy to get the pedals rolling. Cycling shoes are designed to stick onto the pedals and avoid accidental slipping from the pedals. They are also designed to be lightweight enough to make pedaling easier for you. Cycling shoes are the best shoes when it comes to the distribution of power through the legs. They are also ideal for a thorough work out the distribution of muscle strain all through the feet to the hamstrings. Everyday shoes will strain the calves and cause stress to the feet. Cycling shoes will reduce fatigue and allow for longer hours of cycling on any given terrain. They are also practical for indoor cycling maximizing the effect you get with every stroke. Cycling shoes come with a clip-less technology that means the use of clipping. The terminologies easily confuse a beginner but are not hard to grasp. 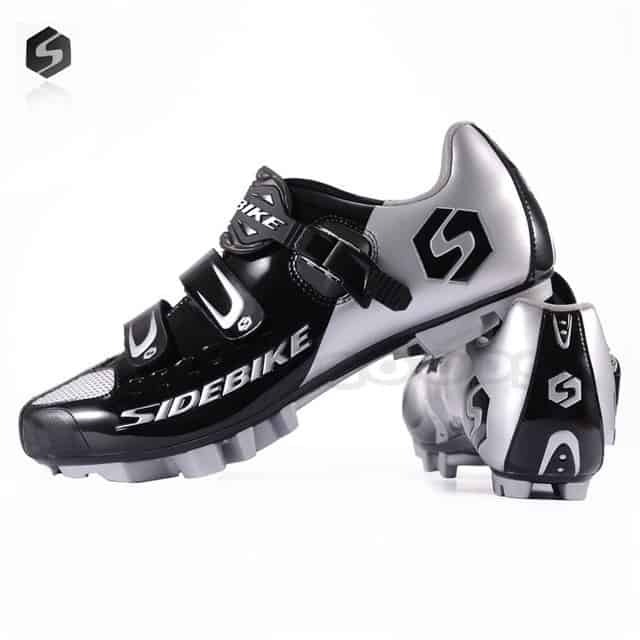 Clipless shoes come with fitted cleats that clip onto the pedal fixing the shoe to the pedal. This may prove tricky for a beginner. Riding with feet firmly set to the pedals often causes toppling over especially when stopping. Clipping the shoes to the pedals is even harder when starting off but gets easier with time. People that are used to shoes without these systems often forget that these shoes are clipped in when approaching junctions or stops and struggle on the last minute to get the shoe on the pedal. This can be quite embarrassing in public especially when you keel over with the bike. Using clipless shoes needs practice on soft grass to soften the blows. Cycling shoes come in different sizes and types. They also come separate from the cleats which are fastened on the shoes using bolts. The fasteners are secured on the shoes which later clip onto the pedals. The pedals come designed to hold onto the braces while allowing easy removal of the same. This, however, takes a little time to master. 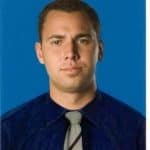 Beginner is advised to prop them against a wall when clipping off to avoid falling over. 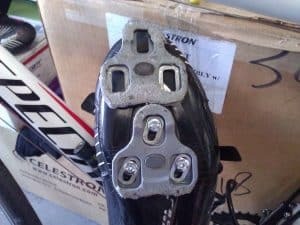 The bike pedals need to be compatible with the cleats. Most bikes will come with ready clip-less pedals while others will need to be installed. It is wise that you consider the options in the market before buying your pedals. Cleats come with three or to holes for fastening cleats. The choice is purely on preference at this point. 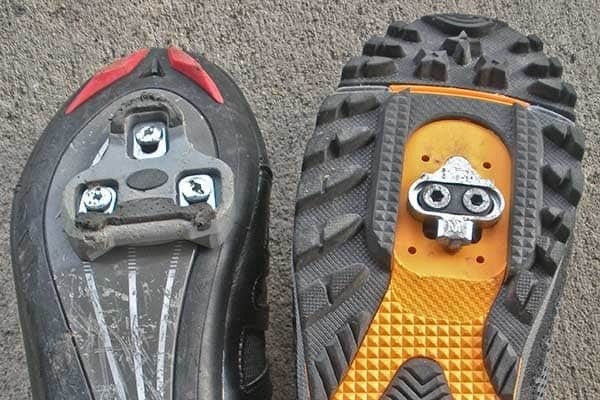 Some shoes come with both options allowing you to use and of the cleats for the bike pedals. The best way to get the clips in place is while riding. Ensure that you have clipped in the first cycling shoe in while the other on is safe on the ground. You simply have to get the pedal in position and push your shoes forward. You will hear a click once the shoes are in place. Start off while you try to do the same with the other foot. This may take a while to master. Keep on trying to place the pedal in position as you push your foot forward with the front part of the shoes slightly inclined to the pedal. This provides a perfect slip in for the cleat. To get the foot off, move the heel away from the bike so as to slide the cleat off the pedal. This will work if your cleat allows side motion. Ensure that you are still on the move while doing this. Stopping down do this will cause a fall over especially if the foot gets jammed. Always remove your foot from the pedals when the bike is at a considerable speed for a proper stop in time to get your feet off the pedals. Compared to most of the other cycling shoes on the market, road bike shoes come with stiffer soles. The shoes are also very light with some made of carbon fiber to enhance this. The shoes are not designed for walking long distances because they lack and form of traction and can be tricky to work with. Some come with small rubber padding at the heel to aid movement on short distances. These mostly come with SPD-SL cleat styles also known as three-hole cleat system or the SDP method referred to as the two hole cleat system. You need to remember that these shoes cannot be used with pedals that are clipless. These use the same system only that the shoes allow walking for long distances. The soles are more flexible enabling the rider to get off the bike and walk on rough terrain or smooth rocks without slipping. This makes them some of the best options for indoor riding, long distance touring and casual riding. The more expensive options incorporate lightweight features and stiffer soles wit ankle protection. Waterproof features and attractive buckling choices. Mountain biking shoes also come with recessed cleats that allow you to walk without the cleats hitting the floor. Those without the recessed clipping make walking on a level floor or tarmac a nightmare. Recessed cleats allow the biker to walk for long without removing the cleats as well as keep the mud off. Some come with removable cleats which can also be time consuming while you are on the trail. Bike shoes are set for indoor and outdoor cycling within the city. These allow for walking and come with very flexible rubber soles. They also have recessed cleats that allow one to walk without the cleats hitting the tarmac. Riding stationary bikes at the gym can be a real challenge especially if you are using regular gym shoes. These tend to not only slip but use more energy to work with. The fact that gyms are slippery due to the polished floors and the sweat makes the regular gym shoes okay. Cycling shoes are however a good idea at the gym despite the fact that they come with stiff soles. Cycling shoes allow the rider to have a more fluid cycle pattern engaging all the leg muscles for a better workout. Shoes that will easily slip off the pedals can be a real struggle especially if you want to push hard. The best shoes for this sort of cycling are mountain biking shoes. These have a recessed cleat and a rubber fitting at the heel of the sole. This allows the user to walk around the gym without slipping or falling. They also clip to the bike pedals allowing the user to have more action while pulling the leg up and pushing them downwards. 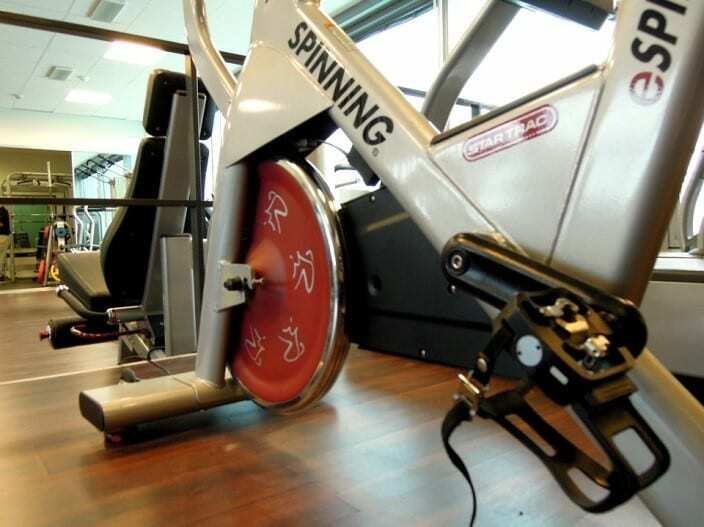 Most gym bikes come fitted with SPD pedals which aid clipless riding. Some will come with both the platform and clipped in options allow the rider to pick from either. Some of the pedals also come fitted with toe cages which hold the gym shoes in place during riding. These enable the user to use normal gym shoes while riding. You can also have your home stationery bike fitted with these pedals using a specialist. The pedals are replaced with SPD pedals of choice depending on the kind of shoes you are going for. Bike shoes come with different closures. Laces are standard and allow you to fit the shoes to the size you want. They, however, get messy in wet and dirty conditions. They also get loose and can easily get into the drivetrain when not carefully knotted. Rips and stick options come in handy when it comes to getting the shoes of and on fast. They are also easy to keep clean in messy situations. Most will have 2 or 3 straps allowing you for a better fit. Buckles with notched cam straps are best but more expensive. They offer secure clamping and provide more security when it comes to fastening feet to the pedals. You will need to consider the size of the shoes when fitting. Snuggly fitting cycling shoes are ideal with a little room to wriggle your toes. Remember that you will be wearing the shoes for a long time in some instances, and so they need to be as comfy as possible. The inner padding needs to be comfortable enough to avoid blistering long the way. Ensure that you go for shoes with ample aeration to avoid excessive sweating. Those that combine this feature with waterproofing are ideal especially if you ride in wet conditions.